Leetonia has a winter newspaper. Its white like all newspaper, but doesn't show up on any schedule. Now if you are wondering who puts out this paper I will tell you, "Mother Nature." Every time it snows even just a little you can read the information just by taking a walk. I know if someone has been down the road and if they have what kind of vehicle they were in. I also know if they had problems sliding or being stuck in a ditch. Of course my favorite news is about the animals. Which animal has walked across the road today: bear, deer, turkey, bobcat, coyote, fox, grouse, mouse or squirrel? This morning I took a long walk with the dogs(8 miles). During our eight miles no vehicles passed us, but we did see a couple of snowmobiles on other trails. Scooter spotted the first animals a little before me, a small flock of Turkeys. Scooter ran quickly after them and got them to fly up in the trees, he was very proud of himself. The two pit bulls watched the event like sports enthusiasts cheering in the stands. 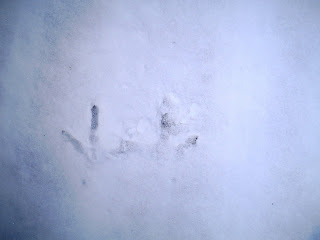 I took a picture of one of the Turkey's footprints. the side of the hill feather marks from his wings flapping as he slide down the entire hill. 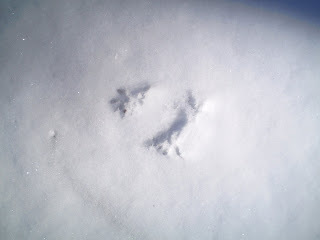 The last picture shows some red squirrel tracks the most common of the tracks I find. I usually see them scurrying across the road and up a tree. Leo the oldest pit bull has a habit of checking every culvert pipe that runs under the road for possible varmints. I have to watch him because he actually goes into the pipe looking for critters; these pipes are not that big and he weighs 65lbs. What amazes me is he will even turn around inside. I have explained many times to him that if he gets stuck, I won't be happy finding a backhoe to dig him out of the road. My reasoning is ignored and I have to keep an eagle eye on him at each pipe. Well the fresh snow has been erased by snowmobilers today so this edition of the Leetonia winter paper is signing out. Mountain girl, Paula, logging out. 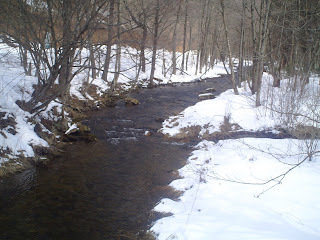 Yesterday, Thor and I went into Wellsboro and then down to Slate Run and Cedar Run. 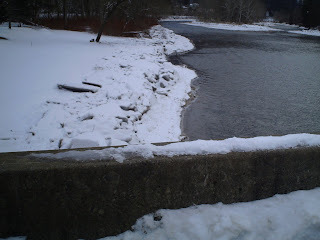 The first picture shows the narrows with our recent snow, the second picture was taken going over the bridge at Cedar Run and shows the ice break-up on the banks of Pine Creek. Although it isn't long until Spring our recent 6 inches of snow and return to single digit overnight temperatures didn't make it feel like Spring. Today it is bright and sunny and in the 20's. I got caught up with everyone in the Pine Creek Valley and it appears there has been a poaching rash. So far as many as nine deer(that they know of) have been shot illegally around the area. The fresh snow makes it easy to see the activity of dragging out a fresh kill. This isn't something new to the area, but you have to wonder if the economy slump will make it even more common. 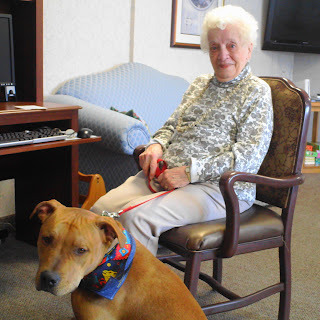 Thor is being trained as a Therapy Dog and is shown in the last picture with one of the residents of Country Terrace, Ester, who is the mother of a friend of mine. He enjoys the attention and the residents seem to love him. On his first trip he wasn't too sure about the walkers, but now is quite comfortable with them. In fact, he is so comfortable with them he noticed some of them had tennis balls on the bottoms of them. I had to let him know he could not play with those balls. Most people barely notice he is missing a rear leg, but when they do want to know his story. When he is sitting it isn't at all noticeable, but when he walks he has a little hop step. At this point his basic obedience is good. I think I am going to have to come up with a few tricks he can do to entertain people as he adapts well to his challenges. Right now going up and down more than 3 or 4 stairs is his most difficult challenge. He has to land that rear leg just right when coming down the stairs. Today we will walk down to Leetonia and do a little work. Mountain girl, Paula, logging out. For two days we had high winds and rain that made Pine Creek rise up above 5 foot for the first time this year. Yesterday morning around 9 am our power went out and wasn't restored until around 11 am today. This really causes no problem for us since I have a generator I use to keep the refrigeration going and pump water. 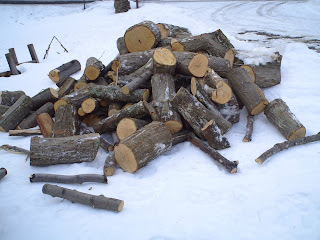 Our heat comes from firewood..no electric required. It is times like these I am glad we heat with wood. The electric company was busy yesterday and around 10 pm their truck pulled up in our driveway. I went out to talk with the guys and they looked like they had been through the wringer. They had driven their big truck up Leetonia Road and it was above freezing. Since the road is not plowed they spent two and a half hours wondering if they would ever get out of the forest. Anytime you drive on a snowmobile packed road and the temperatures go above freezing you drop through the snow. The snow can be as much as a foot and a half deep in places and it tends to pull you to the ditch or worse over the edge. After all they had been through, I couldn't believe, the tired battered electric workers were apologetic about not getting my power on. I just thought, man you risked your life, don't worry about it. 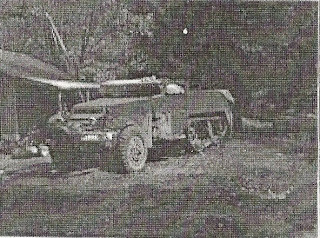 They promised to come back in the morning and showed up with a tracked vehicle, quickly finding the tree doing the damage. These guys should be commended on the lengths they go to just so I can turn on my lights. I am not sure I would go to that much work and peril for one house in the middle of nowhere. In fact, after first hand experience going over the edge...you couldn't pay me enough to do it. The same thing that destroyed my power has now added to my firewood supply as you can see from above. So there is always a blessing to us wood burners with every storm. Just make sure you have your chain saw with you when you drive somewhere after the wind blows. 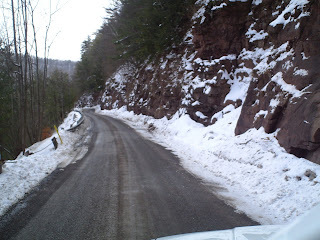 There are still some icy spots on the road, but for the most part you can get in and out when the weather is below freezing if you stay in the middle of the road or be safe and stay on the plowed part. Mountain girl, Paula, logging out. This is what the road looks like in front of the house. 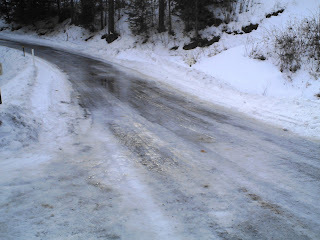 The temperatures are above freezing and have turned what is left of the snow on the road into ice. In places where they don't plow it has made the snow soft. If you try to drive on unplowed areas when the temperatures are above freezing you will be stuck. So much for my road warnings. I had to wear cleated shoes to walk the dogs this morning and the wind was blowing fairly strong. About half way up the mountain I heard a crack and turned around to watch a tree fall. When I started to think about how many years that tree had been growing and in what a short time it fell; I thought what were the chances I would be walking close enough in the whole lifetime of that tree to be there for that few seconds? Often when the wind blows hard you can hear trees fall, but rarely are you looking right at one when it happens. I will have to say I stay out of the pine forest when the wind is hard because very often a branch will fall and I don't want to get hit in the head by it. When the tree fell the dogs alerted to the possibility of some animal making noise and looked at it for some time waiting for it to move again. When it didn't they were on to the next smell or movement they could see. I am sure they didn't put as much thought into the tree fall as I did. Well, I am off to put some windows in will the weather is warm. Mountain girl, Paula, logging off. Bob Weise sent me these pictures of this crazy looking machine called a half-track. It is half jeep and half tank. 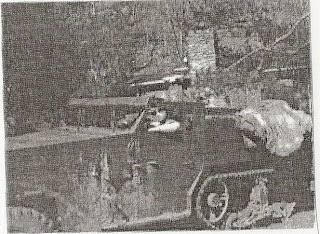 I don't know who is driving it, but I am told they ripped around Leetonia in in during the early 70's wearing german helmets. I guess what they say about boys and their toys is true. They never outgrow them they just get bigger and from the looks of these pictures crazier. In looking at this machine, I will admit some envy. It looks like it could get us in and out of the mountains in any weather. I bet if you put a plow on the front you could just about make your own road. The quality of the pictures are a little poor since it is a copy of a copy, but you still get a feel for the size and construction of this monster machine. I remember Jimmy at the Ruins saying something about a standoff with this machine that might have involved the authorities, but that is another story. If any of you have Leetonia pictures you would like to scan and send to me and my email please do. campeaglebear@yahoo.com I love getting them. Today we started the day in negative temperatures with a negative 8 overnight. However they are still planning above freezing temps for the weekend. I know I and the dogs are looking forward to feeling a bit warmer on our walks. Mountain girl, Paula, logging out! 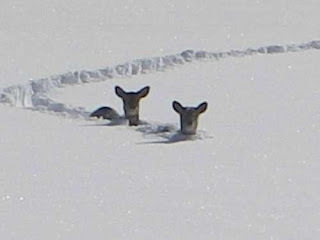 I couldn't resist sharing this photo of deer walking through the snow. I don't know exactly where it was taken, but that gives me the same feeling as I have when I look outdoors and think about how close we are to Spring. Hope you all are staying warm. I was able to get enough firewood to safely make it through next month. So I feel a little bit closer to Spring all the time. Mountain girl, Paula, logging out.